We have a very special guest for this episode. 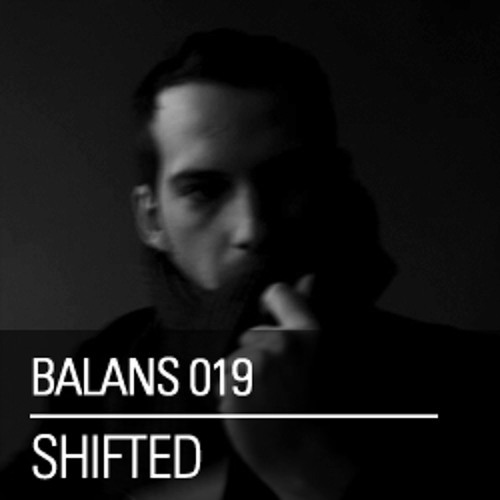 Man of the moment and one of the artists that sets the course for techno as we speak, Shifted, is on duty for episode 19. Noone knows exactly who is behind this mysterious monnniker, all we know he is no newcomer to the electronic arena. His debutalbum 'Crossed Paths' on Luke Slater's Mote Evolver label, is a stunning collection of tracks: rich in textures and with an almost physical ambiance. He made this podcast especially for his appearance at the first edition of BALANS at Melkweg on friday the 6th of july. Enjoy the darkness and make sure you don't miss him in Amsterdam! As always, we had our Q&A with the mystery man: 01.What is you relationship with Balans? No relationship to mention really, i'm just a fan of both the label, which is putting out consistently great music and of Darko as a producer. 02.What do you do to try and stay in balance? Any tips & secrets you would like to share with us night folks? Try to eat well, not drink to much and enjoy life. Stress is the cause of so much ill health, I think if you have a healthy mind then your body follows. 03.About the podcast, can you tell us the story behind the mix? I just wanted to do something more aimed at the Dancefloor. the intro and the outro also have some processed field recordings that i added on top to make it a little more interesting. 04.What gear did you use to make the Balans podcast? Usually i'm playing vinyl, but i just recently moved to Berlin and as a result have no Technics here at the moment. I put this together in Ableton Live. 05.What do you have in store for us (gigs/releases) the coming months? I have a collaboration with Edit Select that just came out on Semantica, I'm also working on a full EP for them. Aside from that theres remixes for Mike Parker, DJ Skirt & Planetary Assault Systems coming soon. And i'm working on a new Pacific Blue 12" and something for Avian.. No doubt there will be another EP for Mote Evolver this year as well. @etappkyle: any luck with this track id?.. @mrchew: Cassegrain & Tin Man - Sear. Finally! Entity by my mate Jay Clarke, unreleased. Awesome track, id please ? @sculp: Not yet, sadly. Need to put in a more concerted effort. @sculp: I'd love to know this one too! Any helpers? Really need a tracklist, amazing set!